(Nanowerk News) New findings at Oregon State University have overturned a scientific dogma that stood for decades, by showing that potassium can work with graphite in a potassium-ion battery - a discovery that could pose a challenge and sustainable alternative to the widely-used lithium-ion battery. Lithium-ion batteries are ubiquitous in devices all over the world, ranging from cell phones to laptop computers and electric cars. 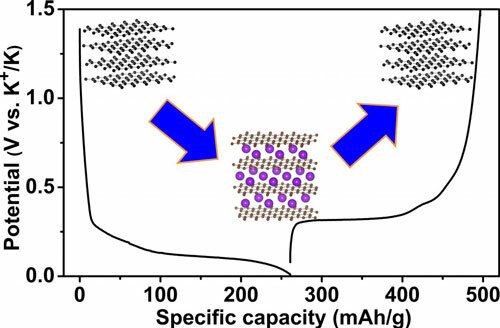 But there may soon be a new type of battery based on materials that are far more abundant and less costly. A potassium-ion battery has been shown to be possible. And the last time this possibility was explored was when Herbert Hoover was president, the Great Depression was in full swing and the Charles Lindbergh baby kidnapping was the big news story of the year - 1932. "For decades, people have assumed that potassium couldn't work with graphite or other bulk carbon anodes in a battery," said Xiulei (David) Ji, the lead author of the study and an assistant professor of chemistry in the College of Science at Oregon State University. "That assumption is incorrect," Ji said. "It's really shocking that no one ever reported on this issue for 83 years." The Journal of the American Chemical Society published the findings from this discovery ("Carbon Electrodes for K-Ion Batteries"), which was supported by the U.S. Department of Energy and done in collaboration with OSU researchers Zelang Jian and Wei Luo. A patent is also pending on the new technology. The findings are of considerable importance, researchers say, because they open some new alternatives to batteries that can work with well-established and inexpensive graphite as the anode, or high-energy reservoir of electrons. Lithium can do that, as the charge carrier whose ions migrate into the graphite and create an electrical current. Aside from its ability to work well with a carbon anode, however, lithium is quite rare, found in only 0.0017 percent, by weight, of the Earth's crust. Because of that it's comparatively expensive, and it's difficult to recycle. Researchers have yet to duplicate its performance with less costly and more readily available materials, such as sodium, magnesium, or potassium. "The cost-related problems with lithium are sufficient that you won't really gain much with economies of scale," Ji said. "With most products, as you make more of them, the cost goes down. With lithium the reverse may be true in the near future. So we have to find alternatives." That alternative, he said, may be potassium, which is 880 times more abundant in the Earth's crust than lithium. The new findings show that it can work effectively with graphite or soft carbon in the anode of an electrochemical battery. Right now, batteries based on this approach don't have performance that equals those of lithium-ion batteries, but improvements in technology should narrow the gap, he said. "It's safe to say that the energy density of a potassium-ion battery may never exceed that of lithium-ion batteries," he said. "But they may provide a long cycling life, a high power density, a lot lower cost, and be ready to take the advantage of the existing manufacturing processes of carbon anode materials." Electrical energy storage in batteries is essential not only for consumer products such as cell phones and computers, but also in transportation, industry power backup, micro-grid storage, and for the wider use of renewable energy.